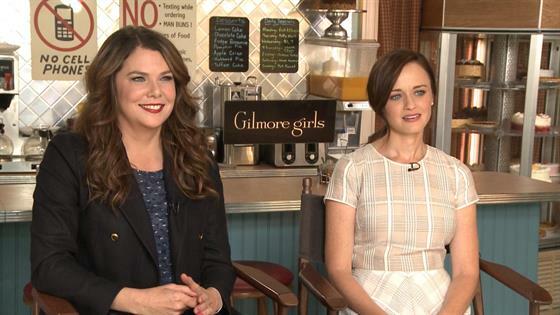 Did "Gilmore Girls" Stars Predict the Future? It begins and ends with four words. "Last four words, actually." With those four words, a lore was born. It was 2006, and Amy Sherman-Palladino was upset. Rightfully so. She would not be returning for the seventh season of Gilmore Girls, the fast-talking, pop-culture obsessed, witty show she birthed in 2000. As fans know, the seventh and Palladino-free (Sherman-Palladino's husband Daniel Palladino was her co-showrunner) season would also be Gilmore's last, and did not end the way the couple intended as they did not return for the final episode in 2007. Of course, that's about to change. In January 2016, after years of whispers, Netflix announced Gilmore Girls would be officially returning for a limited series, with the Palladinos back at the helm, writing and directing all four 90-minute episodes, set to take place over an entire calendar year in Stars Hollow. So how did the lore of the Final Four Words come to be and become an unexpected-but-essential part of the Gilmore Girls mythology? The lore was born in the 2006 exit interview with Michael Ausiello at TV Guide (he is now the Editor-in-Chief at TVLine), in which Amy revealed she knew the last four words. "Really?" Ausiello asked. "Yeah," Amy simply replied. That was all. Two months after Gilmore aired its series finale in May 2007, Sherman-Palladino told reporters at the TCA Press tour that she "didn't watch" the finale, and, when asked about the elusive final dialogue she envisioned ending the show with, she joked, "You're adopted." Then, two years after Gilmore Girls ended, Sherman-Palladino weighed in on the ending of the show, which she still hadn't watched but had heard about, saying she had a "different plan" for the characters and the show, and hinted at the possibility of a reunion movie for the first time in an interview with Entertainment Weekly. "I don't want to totally say [what my ideas were], because if there is a movie in the making, I'm going to be basically delving back into where I left off, and then I'm kind of [screwed]." She continued, "If I thought it was definitely not going to happen, I would say, 'No, it's definitely not going to happen.' But I don't want to say that." Fast-forward to June 2012, when Sherman-Palladino's new show, Bunheads on ABC Family, was debuting, and Ausiello once again asked her about the final four. "For the rest of my life you're going to be asking me that," she said with a laugh, declining to make the reveal. It's worth noting she never asked Ausiello prior to all of their interviews not to ask about it, with Ausiello saying, "Every time I'd ask her what they were she would just respectfully roll her eyes at me and tell me to get a life." Then, in May 2015, Scott Patterson (aka Luke Danes) got the Internet riled up when he said "there are talks going on at the moment" in regards to a revival of some sort on the Gilmore Guys podcast. Binge or Slow-Burn: How Are You Planning to Watch the Gilmore Girls Revival? "I can't really go into any details, but there is some activity. I'm hopeful, and I'm in," he continued, before later reiterating to The Huffington Post that there were "conversations" about "maybe even a movie." In June 2015, Sherman-Palladino quieted rumors of a revival during the show's reunion panel at the ATX Television Festival. Still, she declined to make the big reveal about the final four words just in case an on-screen reunion actually came to fruition. "For a while I thought, ‘I'll just hold on to it in case' — now I'm just being an a–hole," she said. "I'm holding on to it still because in my mind… who knows? But on my deathbed I'll be like ‘rosebud.'" During the same panel, Graham revealed she still didn't know, saying, "I don't wanna know unless I'm saying them or I'm listening to someone say them on the show the way it was intended, otherwise I'd feel sad to know what I wasn't a part of." After that reunion however, the dream of a revival became real, and the duo went to Netflix to pitch their plan, revealing the words in the process. "And then we said, ‘You will never see them committed to paper,'" Amy told EW. After the deal was made, Sherman-Palladino finally brought Graham, Bledel and Kelly Bishop into the secret. While Netflix executives and a few cast members knew how the revival would end, the first real confirmation fans received regarding the final four words came in Graham's interview with Ausiello the day the revival was officially announced by Netflix. When asked if she had read the final script, "Fall," Graham revealed that Sherman-Palladino had told her the words prior to receiving the scripts. Graham went on to reveal that they were an "exchange" between two people, Lorelai and Rory. "Amy already told them to me," Graham told Ausiello. "She didn't realize that I didn't know them. It's actually been helpful not knowing them, because people ask me and I tell them I don't know—because I really didn't know. You know? So I asked her, 'Who says them?' And she says, 'Both of you.' That's all I can say. It's not, you know, in unison." For all of his digging, Ausiello "never found out" the final four words. And he doesn't feel any remorse for helping fuel the mystery behind the elusive dialogue, joking, "Yes, it's all my fault. Are you going to blame Trump on me next?" In March, cast member Yanic Truesdale, who plays Michel, Lorelai's Inn employee, teased the reveal. "I always felt it was intriguing, like everyone else. I was like, 'How does she know the last four words?'" he told Us Weekly. "But when I read it, I was like, 'Oh, OK. That makes sense.' I can see now why she knew that that would be said." But will fans feel the same way? Especially the ones who might head straight for the final episode, too impatient to wait add another 359 minutes to their decade-long wait for the final exchange? "It would be great if people who wanted to see the last four words first got some therapy first and got rid of that inclination," Sherman-Palladino told reporters at the TCA Press Tour in July 2016. "It really is a journey...it's going to mean a lot less if you just flip to the last page. I would hope that people would want to take the whole trip. It's a fun trip. It's worth it." And it will be worth it for Ausiello, who said, "This is one scoop I'm really happy I never got to break." All four 90-minute episodes of Gilmore Girls: A Year in the Life premiere on Friday, Nov. 25 on Netflix.